Playwright, Susan Battye has offered congratulations to Christchurch’s Riccarton High School, Year Eleven Drama Class. On the 2nd and 3rd of July 2018 under the direction of Head of Drama, Paddy Scott, the class presented the premiere performance of her full length stage play, A Colonial Devotion. The play tells the story of a newly-wed and pregnant Jane Deans who arrives at Riccarton from Scotland in 1853, little knowing that her promised life to a successful Canterbury farmer and pillar of the Church of Scotland is soon to demand every ounce of fortitude she can muster to survive. Based on ‘Letters to My Grandchildren’ by Jane Deans, this play brings to life the story of one of New Zealand’s most significant pioneering women. Playwright, Susan Battye was thrilled to see the play staged in Christchurch, her original home town. The play is available for reading or production purposes through Playmarket, New Zealand. Read Susan Battye’s prize winning story, Mocked, in this recently published volume of short stories and poems. People often ask, Why should students study Drama as a subject? By means of the drama that they create and perform, students reflect and enrich the cultural life of their schools, whanau, and communities. Posted in Drama in Education	| Tagged Drama, school	| Comments Off on People often ask, Why should students study Drama as a subject? Congratulations to Team New Zealand and their helmsman, Peter Burling on winning the America’s Cup! Just like Peter Blake, who first won the cup for New Zealand in 1994, Burling began his sailing career in in Tauranga harbour in a P Class yacht – notoriously difficult to sail. There are many comparisons to be made between the two men in terms of their looks and character and dedication to sailing. 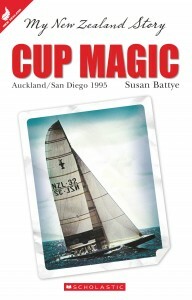 Susan Battye’s My Story series book, Cup Magic, has captured the glory of Team New Zealand’s first time win in San Diego through the eyes of a twelve year old boy, Mike Lucas who witnesses first hand the excitement of the Peter Blake led campaign. No doubt the late Peter Blake, had he been alive today would have been very intrigued by the changes in boat building technology that have taken place since NZL 32, Black Magic took to the water. Who knows what is in store in for Team New Zealand, for Auckland and for young people who can get involved not only in the sport but also in the boat building industry that will no doubt be uplifted by this win? My Story New Zealand – Cup Magic, which was published by Scholastic NZ is currently listed fourth in Scholastic’s list of 100 Kiwi Books! Imagine a school system where students are engaged in learning most of the time because of one thing – a philosophical change from a rigid approach to subject delivery to one where self-expression and creativity through the arts underpins all aspects of the curriculum. This school system is one that most New Zealand baby boomers are familiar with. It’s a system where the more Drama you engage in with your students, the fewer hassles you are likely to have in the classroom! Now the subject of a documentary; The heART of the Matter made by Luit and Jan Bieringa, promises to be a favourite in the 2016 New Zealand International Film Festival. If it’s not been scheduled to screen in your town; request it! The film traces the significant changes that took place after World War II in the New Zealand education system under the leadership of the then director-general of education, Clarence Beeby (1940-1960). That is when the rote-learning environment of Depression and pre-war New Zealand schools was banished to the dustbin of history. In its place arrived the student centred, integrated learning environment that we are familiar with today. Beeby‘s vision was to provide students with access to a thoroughly bicultural, arts-centred education system. Supported by Peter Fraser, the far sighted Prime Minister and Minister of Education of the day, Beeby brought together a remarkable team of visual art, dance, drama, music and physical education specialists. Hundreds of artists in the third year of their teacher training at the Dunedin College of Education were co-opted to work, under the leadership of the Head of Arts and Crafts, Gordon Tovey, with regular classroom teachers in their own classroom. The aim was to promote confidence in the teachers to deliver an arts programme based on knowledge of the subject matter and teaching methodology. There was a strong Māori focus to the Beeby arts programme. Contributing art specialists included Cliff Whiting, Para Matchitt, and Ralph Hotere. According to the film’s director, Luit Bieringa Māori art such as kōwhaiwhai, kapa haka and waiata gained a central place in our mainstream classrooms through in-depth consultation with Ngāti Porou kaumātua Pine Taiapa. Te Ataarangi language programme founder, Kātarina Mataira also provided a focus on valuing the Māori language as part of this programme. Driving this movement to promote the integration of music, art, movement and drama into the wider curriculum, was a commitment to do the right thing by the post war baby boomers. Parents wanted something better for their children than the hierarchical, lack lustre educational environment they had experienced. Gone were barren classroom walls, devoid of any evidence of student work and in their place arrived the colourful enlivened classrooms New Zealand children and their parents have since come to expect as the norm. In the course of researching the film, Luit Bieringa discovered that Beeby recognised the fact that the regular classroom teachers could not be expected to be specialists in the arts. Needless to say for many years the teachers welcomed the artist-educators with open arms into their classrooms. The demise of this artist–educator specialist intervention system that took place in the mid-seventies and early eighties, was deeply regretted by many classroom teachers. The film captures these viewpoints and shows artists at work with students. In fact the methodology on offer, as depicted in the film, appears to tick the desired Key Competency boxes of the New Zealand Curriculum. So why was this Professional Development baby thrown out with the bathwater in the eighties? Short answer: David Lange’s self-governing Tomorrow’s Schools programme. Today the support once offered to the arts teacher as a matter of course via a visiting subject expert is hard to find. The professional development model has changed considerably. Teachers today are increasingly expected to ‘get it off the net’ or attend sporadic assessment focussed workshops that may or may not cater to their needs. The lucky few will make it to workshops offered by subject associations such as Drama New Zealand and increase their knowledge not only of assessment methodology but equally importantly of the subject itself. As a young teacher, fresh from the Christchurch College of Education on the West Coast in 1974, I was lucky to be supported by Christchurch College of Education Drama in Education lecturer, Don McAra and the national Curriculum Officer for Drama, Sunny Amey. She famously visited my Greymouth High School classroom and encouraged me to study for a post graduate Diploma in Drama in Education with Dorothy Heathcote in England. I can see now that Amey and McAra were both deeply imbued with the Beeby philosophy. 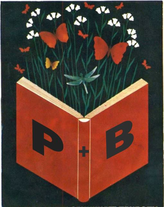 Both were artist-educators in their own right and that mattered a great deal to me because as Luit Bieringa in his Radio New Zealand interview, they could “walk the talk”. The expectation was that I would return to New Zealand and continue to foster this model of teacher support for the arts in general and drama in education in particular. And so I did. I am in no doubt that if it wasn’t for the role modeling I had from these artist-educators and the commitment they made to me as a teacher, that I would have found it difficult to sustain my practice on a daily basis. At an event held in Nelson on 8 May 2016 Drama Magic’s managing director and writer, Susan Battye was awarded third place in the Top of the South, New Zealand Society of Authors short story competition for her story, Mocked. The 2016 competition which was sponsored by Nelson booksellers,Page and Blackmore attracted around 90 entries. The story will be included in anthology of short stories to be published by Page and Blackmore in 2017. Judge, Tina Shaw commented: ‘The ten stories that I read showed skill and humanity, excellent use of storytelling techniques, and strong characterisation. They ran the gamut from teen relationships to the expectations of older generations. ‘The best stories pushed the subject matter in some way, taking an idea in a new direction or trying out a different kind of structure; or did something fresh with language, giving voice to the main character. Several of the stories highlighted a disconnect between generations, and curiously it was often the older person who was depicted as being in the right. There seemed to be a lack of understanding between the generations that insinuated itself through many of these stories. All of the stories showed a fine understanding of human nature. Drama in the classroom – a frippery at best or an essential part of the curriculum? It depends who you talk to, but since 2001 when Drama first became a stand-alone subject in the New Zealand curriculum, we could say that the impact has been significant. In 2015 almost 13,000 students entered one or more NCEA Drama examinations at Levels 1-3. The numbers compare favourably with other more traditional performing arts subjects such as Music and Dance. It is important to consider what has kept Drama as a subject buoyant over the past 14 years. A television commercial was being shot on location in my neighbour’s house today when I went for my morning walk. Picking my way around the white and red-striped cones that lined the footpath, I almost ran into the director, Tammy Davis (aka Munter from South Pacific Television’s series, Outrageous Fortune). It is not uncommon in the New Zealand Film and Television industry to find people doing more than one job. The art of being flexible and resilient is the key to survival in this people-heavy industry. Before 8 am, more than 20 highly-focused people were busy positioning trucks, setting up lighting and camera rigs, dressing the set, organising the wardrobe, no doubt putting make-up on the talent, recording the sound, and getting ready to the shoot the commercial. Elsewhere, the producer will be checking the budget and talking with the client, while an editor will be liaising with a composer or animator. It’s a good bet that the majority of the crew working on this TV commercial will have attended a New Zealand secondary school in the past where they were introduced to the world of drama, film and television and the creative arts as part of their regular classroom studies. What is the relevance of this report for schools, if any? Could it be that the introduction of Drama as a subject in the curriculum might be linked to a developing a level of confidence in our film and television industry? Following the 1984 visit of Professor Dorothy Heathcote, the British Drama as a Medium for Learning exponent, to New Zealand I became the founding president of the New Zealand Association for Drama in Education, now known as Drama New Zealand. Together with and the Curriculum Officer for Drama, Sunny Amey the members of the association, I lobbied the government for the recognition of Drama as a subject in its own right. Today Drama and Dance are well embedded in the New Zealand Curriculum together with the pre-existing subjects of Music and Visual Arts. 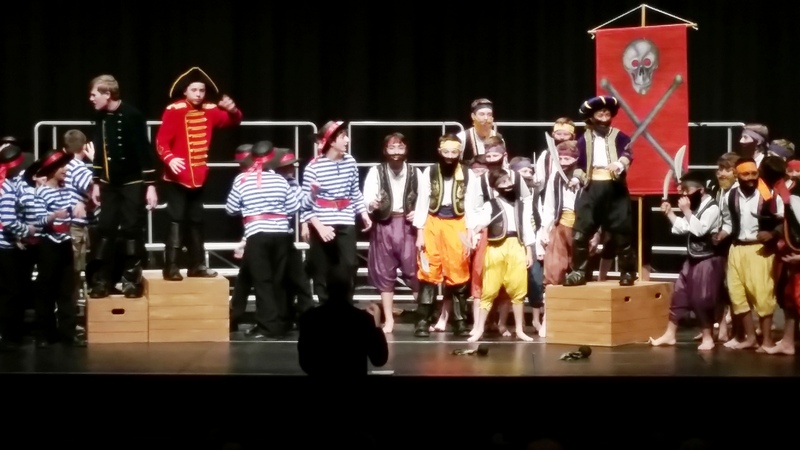 Given that students are now able to gain Levels 1, 2, and 3 Achievement Standards in Drama as well Scholarship Drama, one could be forgiven for thinking that all the battles have been won. And, indeed, students are able to gain the required number of Literacy credits for University Entrance by obtaining Achieved or better in Level 2 and 3 Drama Achievement Standards. But there are many reasons to be nervous. Secondary Drama as a subject would not exist if it were not for the direct encouragement given to the subject by primary and intermediate school teachers. It is they who ignite a spark by providing opportunities in and out of the classroom for students to experience drama. In the present climate, literacy and numeracy are centre stage by virtue of the fact that they are assessed through National Standards. As a direct result, there is a danger that Drama, a subject and a medium for learning, which directly supports literacy, will be marginalised. Teachers themselves could begin to lose confidence in their abilities to use drama if they are not supported to do so. One organisation which works directly with primary teachers and junior high school teachers to encourage the use of drama as a medium for learning is the Mantle of Expert NZ. The cluster groups are co-ordinated by Dr Viv Aitken from Napier’s Eastern Institute of Technology. The organisation will offer a practical series of workshops at a forthcoming symposium, Te AhoTapu: Precious Threads to be held at Hamilton’s Rototuna Junior High School (15-16 October 2016). There are many reasons why students should be given every opportunity to experience drama, both as a participant and as an audience member. Schools frequently find it easier to support the latter rather than the former. Between February and April 2016, excited by the advent of the Pop Up Globe Theatre in Auckland, schools brought thousands of secondary school to see a wonderful range of Shakespeare’s plays being performed ‘in the round’. The quality performances which were presented to mark the four hundredth year anniversary of the death of William Shakespeare, were over-subscribed. It must be clear by now that that Shakespeare’s themes as presented in Romeo and Juliet, Twelfth Night, and other plays during the season are still relevant to students today. The Australian artistic director of Polyglot theatre, Sue Giles, recently wrote in the ASSITEJ Newsletter about the transformative power of theatre: “The nature of theatre; subjective, nuanced, intangible – is one of the things that enables human beings to realise their individual power of expression and belief. The private world of experience is the strength within us all no matter our knowledge or expertise…my thoughts are my own.” (Giles 2016). I have often been amazed at the reactions I have had in the past to my own plays and to the plays written and presented by my Year 12 drama class students when I was teaching at Epsom Girls Grammar School. In an increasingly complex world students can safely explore moral and spiritual dilemmas through classroom drama. On a daily basis they will be ticking the ‘Key Competencies’ and ‘Values’ boxes. Students who choose Drama as a subject will be on a path to becoming potential earners in a growth industry. Many will find themselves in demand as paid performers even before they leave school. In their drama classes they will in fact begin to understand the nature of the contract that exists between performer and audience. However not everyone wants to be an actor, but understanding an actor’s needs will make someone a better script writer, lighting designer, animator or production accountant in the long run. The more support schools can give Drama teachers to make the delivery of their subject attractive and safe, the richer and more long-lasting the impact will be. In conclusion far from being a frippery, it seems that Drama has, in fact, moved centre stage and thoroughly deserves to be supported both as a subject and as a medium for learning by the Ministry of Education, principals and teachers alike. Giles, Sue (2016, April) Introduction. ASSITEJ Newsletter N°74, April 2016. Susan Battye is the former Head of Drama at Epsom Girls’ Grammar School and the current managing director of Drama Magic Ltd, a company dedicated to providing quality, purpose built stage set elements for schools. The Sigma Workbook ‘AS 1.11 Understanding Visual/Oral Texts’ is a write-on student workbook covering the English skills needed to gain Achieved, Merit, or Excellence in this NCEA Level 1 Achievement Standard. The work in this book covers only Achievement Standard 1.9 (AS90856). This new workbook contains a large number of write-on student tasks designed to enable students to practise the necessary skills which will bring a deeper understanding to this area of the New Zealand English curriculum. Students will also find a large number detailed instruction boxes, glossaries and English resources that will help them develop the ideas and processes needed to gain a high level pass in the internal assessment for this Standard. 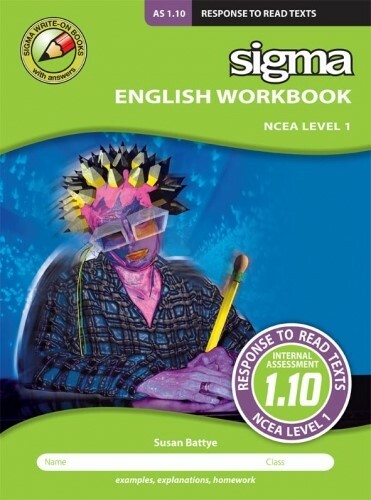 The Sigma Workbook ‘AS 1.10 Response to Read Texts’ is a write-on student workbook covering the English skills needed to gain Achieved, Merit, or Excellence in this NCEA Level 1 Achievement Standard. 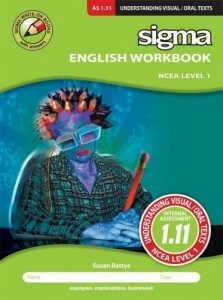 The work in this book covers only Achievement Standard 1.9 (AS90854). This workbook helps students form quality responses to texts they have independently selected and read themselves. Elements such as theme, setting, characters and plot of a text are explored and templates for preparing a Report are included. Beside extended texts, other text types covered include poetry, short story, and plays. A Sample Report is included showing exactly where the phrases that gain achievement, merit and excellence passes are located. An abbreviated version of Achievement Standard 1.10 is included in the resource. 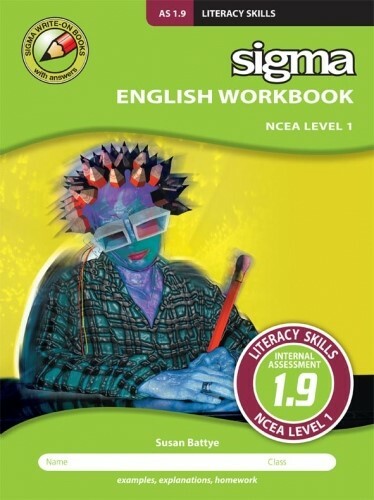 Authors : Susan Battye and David WortTITLE AVAILABLE TO PURCHASE NOWThe Sigma Workbook ‘AS 1.9 Information Literacy Skills’ is a write-on student workbook covering the English skills needed to gain Achieved, Merit, or Excellence in this NCEA Level 1 Achievement Standard. The work in this book covers only Achievement Standard 1.9 (AS90853). This new workbook contains a large number of write-on student tasks designed to enable students to practise the necessary skills which will bring a deeper understanding to this area of the New Zealand English curriculum. Students will also find a large numberdetailed instruction boxes, glossaries and English resources that will help them develop the ideas and processes needed to gain a high level pass in the internal assessment for this Standard.